The Regiment Guard a Pied de Lesdiguieres was raised in 1597 by Francois de Bonne, duc de Lesdiguieres, lieutenant-general of Dauphine. His regiment evolved through many aliases until, in 1791, it became known as the 19eme Regiment d’infanterie de Ligne. The re-organisation of 1793 led to the formation of the 19eme demi-brigade de Bataille, changing to the 19eme demi brigade d’infanterie de Ligne in 1796. On the 6th of November 1792, the 19eme earned the battle honour ‘Jemappes’ when Dumouriez surprised the Austrians with a late advance and took the whole of Belgium. During the Italian campaign, the 19eme served at Loano, Mondovi, Borgehetto, Siege of Mantoue, Lonato, Castaglione, La Favorite, Caldiero and Arcole. In 1798 the 19eme formed part of the French garrison in Corsica under Major General Vaubois. Both Vaubois and the 19eme were called up to form part of the Army of the East and landed in Malta at Madliena and St. Julians, opposed by shore batteries. 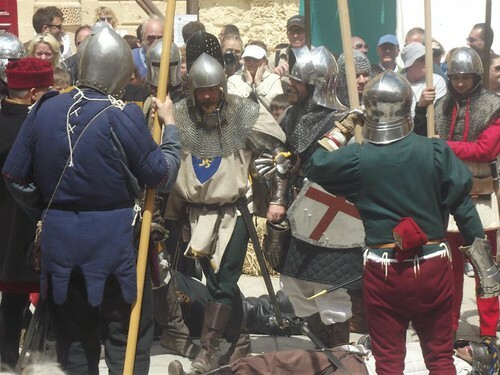 Their tasks were to engage Forts Tigne and Manoel, to patrol from Qormi to Paola and to capture Lija, Attard and Mdina. 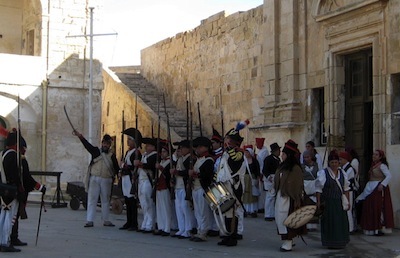 Six days later, the 19eme embarked for Egypt leaving 700 men of the Second Battalion to form part of the Malta garrison. 10 women and 9 children accompanied them.